The Pennsylvania Outdoor Writers Association presented the annual Excellence in Craft Awards during its Spring Conference banquet at Holiday Inn Harrisburg-Hershey on May 20, 2017. 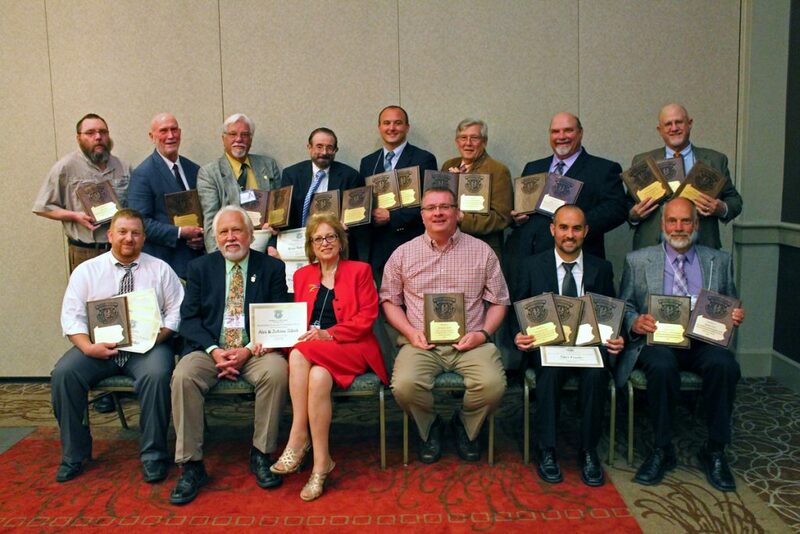 Awards Chair Brad Isles distributed first-place awards to 16 individuals in 28 categories. There were over 300 total entries by 46 members. 1. Best Newspaper Column (sponsored by Bob & Linda Steiner) – “My Grandad… my light” by Wade Robertson, published in the Olean Times Herald on Dec. 25, 2016. Runner-up – “Residents say rare deer illegally killed” by Mark Nale, published in the Centre Daily Times on Jan. 24, 2016. 2. Best Newspaper Feature (sponsored by Pennsylvania Hunters Sharing the Harvest) – “Record gun sales boost conservation” by Bob Frye, published in the Tribune-Review on June 5, 2016. Runner-up – “Consider a River” by Ben Moyer, published in the Pittsburgh Post-Gazette on June 5, 2016. 3. Best Magazine or Regional Newspaper Column (sponsored by Gogal Publishing Co.) – “A shore-side ode to a not-so-salty sea dog” by Terry Brady, published in Pennsylvania Outdoor News on Nov. 4, 2016. Runner-up – “Casting our lot in life” by Marshall Nych, published in Countryside Magazine, Jan./Feb. 2016. 4. Best Magazine or Regional Newspaper Feature (sponsored by Blackpowder Products Inc.) – “Alpha & Omega” by Bob Ford, published in Better Beagles, April 2016. Runner-up – “Haunted by Hunters” by Gregg Rinkus, published in Pennsylvania Game News, October 2016. 5. Best Published Newspaper Photo, Color or Black & White (sponsored by POWA Past Presidents) – “Two does in snow” by Mark Nale, published in the Centre Daily Times on Feb. 7, 2016. Runner-up – “Rustling leaves, rustling feathers” by Tim Flanigan, published in the Daily Mining Gazette on Oct. 14, 2016. 6. Best Published Magazine Photo, Color or Black & White (sponsored by the Pennsylvania Forest Coalition) – “Tundra Swan Spraying Water” by Tim Flanigan, Pennsylvania Game Commission Birds of Pennsylvania calendar, January 2016. Runner-up – “Stalking puma” by Joe McDonald, published in Nature Photographer, Spring 2016. 7. Best Book Award (sponsored by POWA EIC entries) – “Understanding Coyotes” by Michael Huff. Runner-up – “The Pine Creek Rail-Trail Guidebook” by Linda Stager. 8. Best Published Art Award, Color or Black & White (sponsored by the National Rifle Association) – “Real Game Savers” by Gerald Putt, cover of Pennsylvania Game News, October 2016. 1. NRA Best of the Best Award (sponsored by the National Rifle Association) – “Nun Sense” by Steve Sorensen, published in North American Whitetail, Nov. 2016. 2. POWA Pass it on Award (sponsored by the National Rifle Association) – “Soldier scores first buck with secondhand bow” by Tyler Frantz, published in the Lebanon Daily News on Nov. 20, 2016. Runner-up – “Thirty Years at Camp” parts 1 & 2 by Don Feigert, published in The (Sharon) Herald on July 3 and July 17, 2016. 3. Wildlife Conservation Partnership Award (sponsored by the Pennsylvania Game Commission) – “The Role of the Hunter and the Gun in Wildlife Conservation” by Tim Flanigan, published in NRA Hunters’ Leadership Forum, on Sept. 25, 2016. Runner-up – “For the Love of the Game” by Bob Frye, published in the Tribune-Review on May 29, 2016. 4. Hawk Mountain Sanctuary Raptor Conservation and Eco-Tourism Award (sponsored by Hawk Mountain Sanctuary) – “Birding enthusiasts flock to Hawk Mountain for fall raptor migration” by Mark Demko, published in The Morning Call on Oct. 3, 2016. Runner-up – “Hawk Mountain Sanctuary worth a visit” by Wade Robertson, published in the Bradford Era on Aug. 19, 2016. 5. The Pennsylvania Elk Resource Award (sponsored by the Keystone Elk Country Alliance) – “Improving our Environment” by Dave Wolf, published in the Dillsburg Banner on Feb. 25, 2016. Runner-up – “Centre County bull elk hunters had succesful season” by Mark Nale, published in the Centre Daily Times on Nov. 13, 2016. 6. Best Action Hunting, Trapping or Fishing Photograph (sponsored by POWA EIC entries) – “Hunter harvest” by Tyler Frantz, published in the Lebanon Daily News on Dec. 4, 2016. Runner-up – “An excited pack of dogs” by Ralph Scherder, published in Sports Afield, Nov./Dec. 2016. 7. Best Conference-Related Material Award (sponsored by POWA EIC entries) – “Enjoyable outdoor writers’ conference in Sayre, PA” by Mark Nale, published in the Centre Daily Times on May 17, 2016. Runner-up – “Hunting turkeys in 2 states is rewarding” by Tyler Frantz, published in the Lebanon Daily News on May 21, 2016. 8. Best Published Pennsylvania Fishing Or Boating Related Newspaper Photo, Color Or Black & White (sponsored by the Pennsylvania Fish & Boat Commission) – “Interest in kayaking grows in Pennsylvania,” by Tyler Frantz, published in the Lebanon Daily News on July 24, 2016. Runner-up – “Big fish, little attention” by Bob Frye, published in the Tribune-Review on June 5, 2016. 9. Don Heckman – Tell the Story Award (sponsored the Pennsylvania Chapter of the NWTF) – “NWTF chapters help turkey environment” by Tyler Frantz, published in the Lebanon Daily News on Oct. 28, 2016. Runner-up – “Game Commission enlisting help from citizens to trace turkeys” by Mark Nale, published in the Centre Daily Times on Aug. 7, 2016. 10. Handloading Promotion Award for Broadcast Media (sponsored by Redding Reloading) – “Lock & Load with Redding Reloading” by Charlie Burchfield, Gateway Outdoors broadcast on Aug. 15 ,2016. Runner-up – “Reloading with Fred Pickard” by Alex & JoAnne Zidock, Out in the Open broadcast on Dec. 1, 2016. 11. Handloading Promotion Award for Electronic Media (sponsored by Redding Reloading) – “Going with the Grain” by Marshall Nych, published on BucktailOutdoors.com, Fall 2016. 12. Handloading Promotion Award for Print Media (sponsored by Redding Reloading) – “It’s family tradition at the reloading bench” by Wade Robertson, published in the Olean Times Herald on Sept. 25, 2016. Runner-up – “Reloading and the .257 Roberts” by Ralph Scherder, published in Ohio Valley Outdoor Times, June 2016. 13. Outdoor Blog Entry Award (sponsored by POWA EIC entries) – “The Nun’s World Famous Deer Hunt” by Steve Sorensen, published on LegendaryWhitetails.com on Dec. 5, 2016. Runner-up – “Planning an Out-of-State Hunt” by Ralph Scherder, published on BucktailOutdoors.com, Spring 2016. 14. Pennsylvania Trappers Award (sponsored by the Pennsylvania Trappers Association) – “Beyond the Bridges” by Ralph Scherder, published in American Trapper, July/August 2016. Runner-up – “It’s not about the money” by Ralph Scherder, published in Ohio Valley Outdoor Times, Jan. 2016. 15. Trout and the Coldwater Resource Award (sponsored by Pennsylvania Council of Trout Unlimited) – “Survival threats to our native brook trout” by Don Feigert, published in The (Sharon) Herald on April 17, 2016. Runner-up – “The need for clean water” by Dave Wolf, published in the Dillsburg Banner on Aug. 11, 2016. 16. White-Tailed Deer Award (sponsored by POWA EIC entries) – “Nun Sense” by Steve Sorensen, published in North American Whitetail, Nov. 2016. 18. Young Trees Habitat Award (sponsored by the Allegheny Chapter of the Ruffed Grouse Society) – “Multi-partner cooperation rejuvenates Woodcock Trail and habitat” by Mark Nale, published in The Daily Herald on Jan. 19, 2016. 19. Youth Fishing Award (sponsored by Expositions, Inc.) – “The first day of trout season is a time to explore” by Charlie Burchfield, published in Tri-County Sunday on April 10, 2016. Runner-up – “Forever Young” by Marshall Nych, published in Pennsylvania Outdoor Journal, April/May 2016. 20. Youth and the Hunting/Shooting Sports Award (sponsored by the National Shooting Sports Foundation) – “Measure of a Man” by Marshall Nych, published in Pennsylvania Game News, Jan. 2016. Runner-up – “Pumping Daisies” by Marshall Nych, published in Airgun Hobbyist, Oct./Nov./Dec. 2016.